This performance is no longer available for sale online. Please call the box office at 808 885-6868 for more information. A reading series of Hawaiian works directed by Bree Peters in the Mike Luce Studio. Shipment Day by Lorenzo DeStefano is the next reading in the series. Kona Dance & Performing Arts presents new choreography from it's teaching corps in this song & dance concert. Over 140 performing arts students, ages 3 - 18 will perform Jazz, Ballet, Contemporary, Tap, Musical Theatre, Hip Hop, and Breakdance in handpicked costumes and a variety of music choices. Join Prince Dance Theatre for its original production of “Perspektives”— a theatrical dance performance - directed by Angel Prince and written by Noelani Anderson. 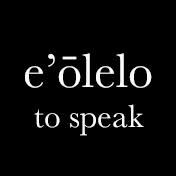 In the 1970’s Robert Cazimero and his family were the driving force behind the Hawaiian renaissance of arts and culture. That resurgence launched his career in which, now, thirty years later, is stronger than ever. 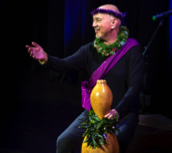 Musician, composer, kumu hula; his work in each of these areas is known throughout the world. No Kahilu Season would not be complete without hosting the man whose voice in story or song makes us take flight. A reading series of Hawaiian works directed by Bree Peters in the Mike Luce Studio. Ola Na Iwi by Victoria Knuebel is the next reading in the series. West Hawaii Dance Theatre & Academy proudly presents the comedic ballet “Coppélia” at the Kahilu Theatre. 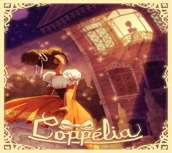 Coppélia is a sparkling tale of a mysterious inventor, his life-sized doll and an inquisitive young couple, filled with magic, mischief and many comical delights. This light-hearted ballet is full of warmth, romance and laughter, and has been entertaining fans of all ages all over the world with its magic, mischief and many comical delights. 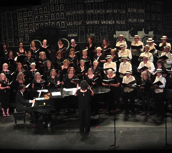 Waimea Community Chorus presents music recorded by Queen, ABBA, Jim Croce, Three Dog Night, Led Zeppelin, Carole King and more. Songs from musicals Evita, A Chorus Line, The Wiz and the Phantom of the Opera will round out the sounds of the 1970s. HI Tide Nation proudly presents Mike Love Band. 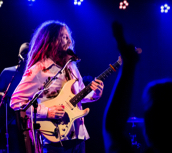 With a foundation rooted in the spirituality and message-based music of Reggae and Rastafari, Mike Love blends the sounds of progressive and classic rock, pop, R & B, soul, blues, flamenco, jazz and so much more. Healing is at the core of his music. The Grammy Award winning singer who has appeared in the Oscar winning documentary 20 Feet From Stardom, now steps out on her own with her backing trio, Grand Baton. 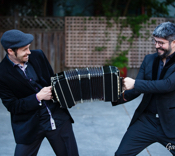 Pablo Estigarribia and Adrian Jost present an eveningnof tango for piano and bandoneón. From classics to original compositions, their collaborations bring new life into the heart of tango - tradition layered with fresh harmonies and perspectives: stories of life, love, and loss articulated through the hands and minds of two great talents. After the concert, there will be DJed tango music for dancing. 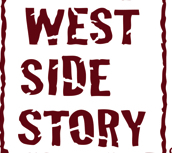 A collaboration between Waimea’s own Beth Dunnington and Angel Prince, West Side Story will showcase our Kahilu Theatre Youth Troupe. This production will extend our students singing, acting and dancing horizons in this brilliant and relevant musical with a book by Arthur Laurents, music by Leonard Bernstein and lyrics by Stephen Sondheim. Winners of two successive NaHoku Hanohano Awards for Alternative Album of the Year, Streetlight Cadence is an alternative folk pop trio. 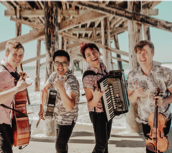 Jonathon (violin), Jesse (accordion), and Brian (cello) began as street performers in Honolulu. The group is known for its unique instrumentation and arrangements in their music. Jonathon, Jesse and Brian can be described as fun-loving, energetic and demonstrate an enormous love for music and friendship in their live performances.